An irregular heartbeat, such as a high heart rate, is an issue for millions of Americans. In fact, some research shows that one in four American adults over age 40 may develop an irregular heartbeat—also called a heart arrhythmia. Fortunately, there are many natural ways to help manage this problem, including foods that lower heart rate. The heartbeat will get quicker in those who experience frequent stress, anxiety, or participate in physical activities like running or other strenuous exercise. Most of the time, a fluttering feeling in the chest is harmless; however, some cardiac arrhythmias are very dangerous and require immediate attention. Emotional stress and anger can certainly make the heart work harder, which also increases blood pressure and cortisol levels. That is why it is important to know how to reduce heart rate naturally, including the foods that lower heart rate and blood pressure. This article will also detail how to lower your heart rate naturally with deep breathing, vagal maneuvers, acupuncture, and other alternative therapies. The resting heart rate is the heart pumping the lowest amount of blood when you are not exercising. What is a normal resting heart rate? A normal resting heart rate, when you are calm, relaxed, and healthy, will range between 60 and 100 beats per minute for adults. That being said, a normal heart rate will vary from person to person, and throughout a person’s day. A heart rate lower than 60 beats isn’t necessarily a problem. Factors that affect heart rate include drugs like beta-blockers, body position, and anxiety or stressful emotions. A lower heart rate is also common in athletes and those that get lots of physical activity. The heart also pumps a little more and the pulse rate increases when the humidity is high. If you’re obese, you may also see a higher resting pulse than normal, but not too much over 100 beats per minute. It is important to note that an above normal heart rate can be a sign of several problems, and symptoms may include fainting, weakness, chest pain, lightheadedness, low blood pressure, heart pain, and inadequate blood flow in the legs and arms. For an accurate heart rate reading, simply put your fingers over your pulse and count the number of beats per minute. You could also count the beats in 15 seconds and multiply the number by four. The best places to find your pulse are the wrists, side of your neck, inside of your elbow, and top of the foot. Want to know how to lower your heart rate in the moment? A few techniques can help bring your heart rate back to normal right away. For instance, if you’re going from sitting to standing, make sure you rise slowly. This is because standing too quickly can make you dizzy and increase your heart rate. Also, make your home and other surroundings cool and comfortable, since high temperatures increase heart rate and blood flow. There are also other approaches that help reduce heart rate in the short term and long term. Vagal maneuvers are natural treatments that are used to slow a rapid heartbeat by stimulating receptors of the internal carotid arteries (two major blood vessels in your neck). This stimulation causes reflex stimulation of the vagus nerve, which releases the neurotransmitter acetylcholine and slows electrical impulses that lead to rapid heartbeats. Place an ice pack on the face or emerge the face in cold water for around 10 seconds. This helps reduce the heart rate while creating a physiological response similar to when you jump into cold water. Blowing through a syringe is also called the Valsalva maneuver. This is where you blow into a syringe when lying down, face up, for 15 seconds. This method increases pressure within the chest cavity, and slows the heart rate to potentially stop abnormal rhythm. The carotid arteries supply blood to the face, neck, and brain. A carotid massage will apply pressure under the jaw in a gentle, circular motion for around 10 seconds. This is not recommended for those with carotid artery stenosis or a history of smoking. Research shows that acute emotional stress can have significant impact on heart rate; therefore, managing stress is a beneficial part of treatment. Deep breathing, mindfulness meditation, yoga, prayer, and relaxation therapy can all help reduce your heart rate. Inhale for five seconds, hold your breath for five seconds, and exhale for five seconds to lower heart rate with deep breathing. Acupuncture is well documented to improve cardiovascular functioning. One review of eight studies from 2008 shows that 87% to 100% of the participants using acupuncture would convert to a normal heart rhythm. The researchers concluded that acupuncture is effective for the treatment of various cardiac arrhythmias. Research shows that stable weight loss reduces irregular heart rate. A 2016 study, in particular, found that the most common arrhythmia type, atrial fibrillation, is linked to obesity and being overweight, whereas overweight populations in general have higher severity, progression, prevalence, and incidence of atrial fibrillation compared to those of a normal weight. Tobacco smoke is considered the most preventable cause of death and modifiable risk factor for coronary diseases. As a result, quitting smoking is a good idea to help prevent the development of cardiac arrhythmias or an irregular heartbeat. A regular exercise plan and daily physical activity can also help those with an irregular heartbeat maintain a normal heart rate and healthy heart. Evidence also shows that exercise improves lipid profile, blood pressure, and overall mortality. Do you want to know how to lower heart rate and blood pressure with diet? Eating a healthy diet with anti-inflammatory foods is important since they contain antioxidants and phytonutrients that reduce the overactive response of the immune system. These are foods that help regulate heart rate. 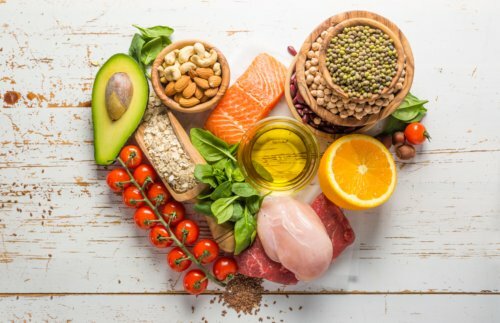 Healthy fats and animal proteins in particular help balance cholesterol and increase HDL (high-density lipoprotein) cholesterol—also called good cholesterol. In addition, there are several foods that lower heart rate as part of an anti-inflammatory diet, especially fiber-rich vegetables and all kinds of fruits, and herbs and spices, and beans and legumes. What are specific foods that lower heart rate? Let’s take a look at how to lower your heart rate naturally with food. Some foods with the most antioxidants include goji berries, wild blueberries, elderberries, cranberries, dark chocolate, and artichokes. Foods high in antioxidants like quercetin and lutein are well known to protect against heart disease and blood vessel problems. Bananas are a great source fiber, magnesium and potassium, which are useful for reducing the risk of heart disease, preventing high blood pressure, and regulating heart rate. Potassium benefits heart rate because it regulates circulation, water retention, and sodium within the body. Most raisins are produced from Thompson seedless grapes. They are also full of fiber, magnesium, and potassium, which makes raisins great for overall heart health especially lowering blood pressure and regulating heart rate. Eat a handful of raisins three times daily to help regulate your heart rate. This green leafy vegetable is able to protect heart health by improving the functions of nitric acid. In turn, this improves blood pressure, circulation, and blood vessel health. Spinach is also a good source of heart rate-regulating potassium. Nuts in general are excellent for heart health and regulating heart rate, especially almonds and Brazil nuts. They are high in healthy fats, and other key heart health nutrients, such as magnesium, calcium, selenium, and potassium. Seeds are another healthy fat source that is excellent for heart health. Some of the better heart rate-regulating seeds include flaxseed, hemp seeds, sunflower seeds, chia seeds, pumpkin seeds, and sesame seeds. Sesame seeds in particular improve thyroid health, and the thyroid gland is responsible for regulating heart rate. Beans and legumes in general are also very beneficial for heart health and heart rate regulation. Some of the most common legume varieties include kidney beans, chickpeas, lentils, and green beans. Research shows legumes benefit the heart through reducing blood pressure, triglycerides, and inflammation. Pumpkin is more than a pie filling or Halloween decoration. It is full of antioxidants like beta-carotene, which may offer protection against heart disease and regulate heart rate. Pumpkin also contains other heart rate-regulating nutrients such as magnesium, potassium, and fiber. Wild-caught fish like salmon, tuna, and sardines are another important factor for reducing heart rate and overall heart health. One cross-sectional analysis of about 10,000 European men without heart disease published in the journal Circulation in 2003 showed that fish consumption was linked with a reduced heart rate. This is likely due to the abundant omega-3 fatty acids found in these types of fish. Some believe the avocado is the planet’s most nutritious food. Avocados are especially good when it comes to heart health, and regulating blood pressure and heart rate. These green and creamy fruits contain heart healthy monounsaturated fats, magnesium, potassium, and fiber. Coconut oil is high in saturated fats, which do a good job of increasing HDL (high-density lipoprotein) cholesterol and promoting a healthy heart rate and a lower risk of heart disease. Several herbs help benefit heart health, including cilantro, thyme, basil, oregano, parsley, and raw garlic. Research shows that garlic benefits people with uncontrolled hypertension. The polysulfides in garlic promote blood vessel health, blood pressure reduction, and hence also heart rate regulation. Garlic could also reverse early heart disease and plaque buildup in the arteries. Spices also benefit heart health, especially cinnamon, paprika, cayenne pepper, cumin, ginger, and turmeric. The curcumin in turmeric has been shown to have strong antioxidant activity that could potentially reduce heart inflammation, prevent atherosclerosis, and reduce irregular heartbeats. The bottom line is that an elevated heart rate can signal a serious heart problem, with possible complications including frequent fainting, heart failure, and blood clots. These all can lead to stroke or heart attack, and in rare cases, sudden death also may occur. Ventricular tachycardia is another complication where the ventricles of the heart beat faster than normal, and this can lead to dysrhythmias and problems with the blood pumping efficiently throughout the brain and body. That is why therapies and foods that help regulate heart rate are important. Vagal maneuvers, deep breathing, yoga, acupuncture, and regular exercise can all help lower your heart rate in the moment and over the long term. Some of the key foods for heart rate regulation include turmeric, garlic, spinach, avocado, bananas, nuts, seeds, beans, and other legumes. Keep this in mind if you have problems with an irregular heartbeat. Lloyd-Jones, D.M., et al., “Lifetime Risk for Development of Atrial Fibrillation,” Circulation, Aug. 30, 2004; 110:1042-1046, doi: 10.1161/01/CIR.0000140263.20897.42. “Irregular Heartbeat: What You Need to Know + How to Naturally Treat,” Dr. Axe; https://draxe.com/irregular-heartbeat/, last accessed Nov. 12, 2017. Connor, E., “How to Lower Your Heart Rate: In the Moment and Over Time,” healthline, Feb. 7, 2017; https://www.healthline.com/health/how-to-lower-heart-rate#overview1. “All About Heart Rate (Pulse),” American Heart Association; http://www.heart.org/HEARTORG/Conditions/HighBloodPressure/GettheFactsAboutHighBloodPressure/All-About-Heart-Rate-Pulse_UCM_438850_Article.jsp#.Wd9-0BNSxsN, last updated Aug. 22, 2017. “What’s a normal resting heart rate?” Mayo Clinic; http://www.mayoclinic.org/healthy-lifestyle/fitness/expert-answers/heart-rate/faq-20057979, last accessed Oct. 12, 2017. “How to Slow Your Heart Rate Down,” wikiHow; https://www.wikihow.com/Slow-Your-Heart-Rate-Down, last accessed Oct. 12, 2017. VanWormer, A.M., et al., “The effects of acupuncture on cardiac arrhythmias: a literature review,” Heart Lung, Nov. to Dec. 2008; 37(6): 425-431, doi: 10.1016/j.hrtlng.2007.11.002. Nalliah, C.J., et al., “The role of obesity in atrial fibrillation,” European Heart Journal, May 2016; 37(20):1565-1572, doi: 10.1093/eurheartj/ehv486. D’Alessandro, A., et al., “Nicotine, cigarette smoking and cardiac arrhythmia: an overview,” European Journal of Preventative Cardiology, June 2012; 19(3):297-305, doi: 10.1177/1741826711411738. “Top 10 High Antioxidant Foods,” Dr. Axe; https://draxe.com/top-10-high-antioxidant-foods/, last accessed Oct. 12, 2017. “Banana Nutrition, Concerns, Benefits & Recipes,” Dr. Axe; https://draxe.com/banana-nutrition/, last accessed Oct. 12, 2017. “Raisins Nutrition: 5 Surprising Benefits of this Superfood,” Dr. Axe; https://draxe.com/raisins-nutrition/, last accessed Oct. 12, 2017. “Spinach Nutrition, Health Benefits & Recipes,” Dr. Axe; https://draxe.com/spinach-nutrition/, last accessed Oct. 12, 2017. “Sometimes You Feel Like a Nut,” Dr. Axe; https://draxe.com/sometimes-you-feel-like-a-nut/, last accessed Oct. 12, 2017. “Sunflower Seeds: Benefits, Nutrition & Recipes,” Dr. Axe; https://draxe.com/sunflower-seeds/, last accessed Oct. 12, 2017. “What Are Legumes Good For? Top 6 Benefits of Legumes,” Dr. Axe; https://draxe.com/what-are-legumes/, last accessed Oct. 12, 2017. Ware, M., “Pumpkins: Health benefits and nutritional breakdown,” Medical News Today; https://www.medicalnewstoday.com/articles/279610.php, last updated Sept. 25, 2017. Dallongeville, J., et al., “Fish Consumption Is Associated with Lower Heart Rates,” Circulation, Aug. 18, 2003; 108:820-825, doi: 10.1161/01.CIR.0000084542.64687.97. “Avocado Benefits: The Most Nutrition-Packed Food on the Planet?” Dr. Axe; https://draxe.com/avocado-benefits/, last accessed Oct. 12, 2017. Eyres, L., et al., “Coconut oil consumption and cardiovascular risk factors in humans,” Nutrition Reviews,” March 5, 2016; 74(4):267-280, doi: 10.1093/nutrit/nuw002. “7 Raw Garlic Benefits for Reversing Disease,” Dr. Axe; https://draxe.com/7-raw-garlic-benefits-reversing-disease/, last accessed Oct. 12, 2017. Blaylock, R., “Powerful, Safe Treatments for Arrhythmia,” News Max, March 4, 2015; http://www.newsmax.com/Health/Dr-Blaylock/arrhythmia-heart-attack-curcumin-fibrillation/2015/03/04/id/628267/.